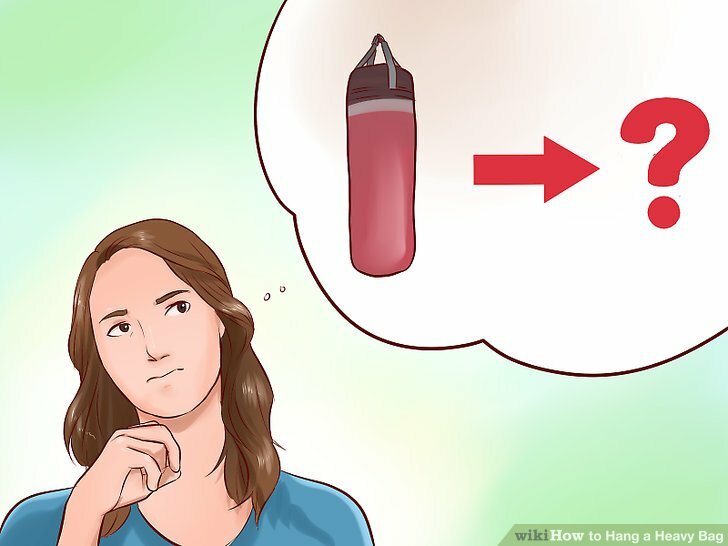 A heavy bag is a piece of exercise equipment that helps build strength from arm and leg resistance training and provides an intense cardio workout. You don’t have to be a professional boxer or be a member of a gym to use a heavy bag. Heavy bags can be attached to the ceiling, wall, or to a stand, and can be successfully installed into your own home. Decide where the bag will go. Think about the space in your home. Do you have a basement or work room? The amount of space you have will determine where you can put the bag. If the bag isn’t in the middle of the room, it could potentially break something or rebound off the wall and come back at you, causing injury. Find a strong support beam. Support beams are narrow beams that run along the ceiling with spaces between. Generally, the space between support beams is 16″, but they can be as wide as 24″. Most people want to hang their bag from the ceiling for better mobility. 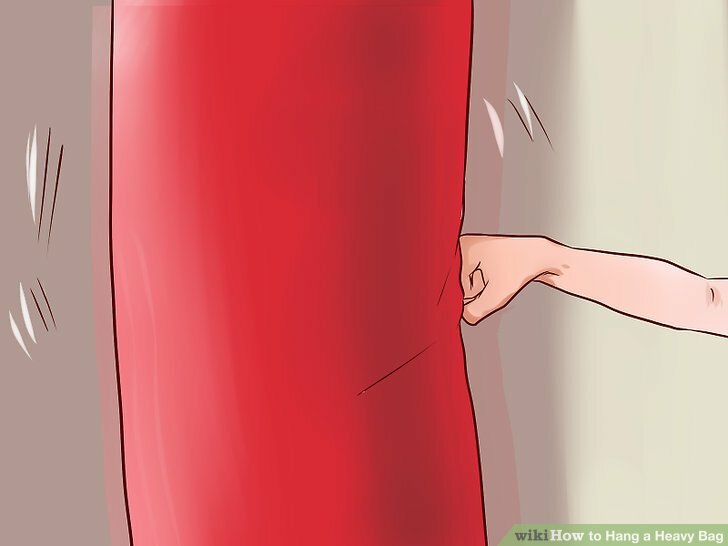 When doing this, make sure you plan on attaching the heavy bag to a strong support beam. The beam must be able not only to take the weight of the heavy bag, but also the impact as it swings. One of the easiest ways to find a support beam is to use a stud finder. Another way to find the support beam is to use the knock test. 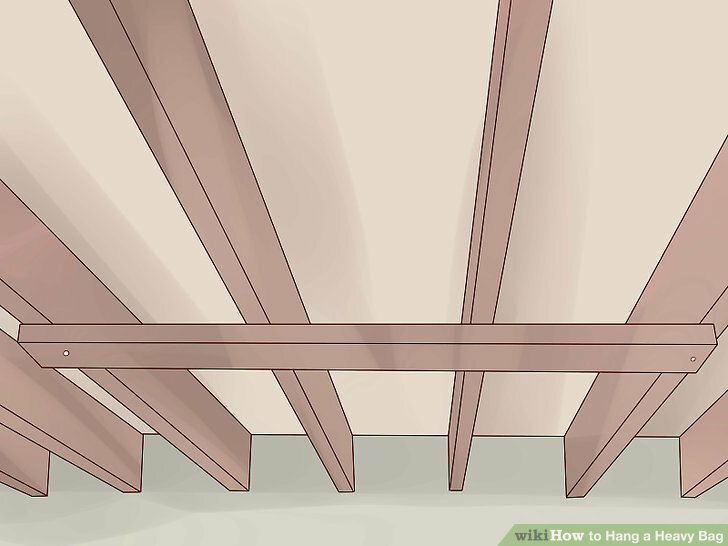 Knock along your ceiling; if you hear a hollow sound, there’s no support beam behind it. When you hit a support beam, the sound will change and no longer be hollow since you are knocking on a piece of wood. You can also measure from the wall to find the support beam. Place a tape measure against the edge of the wall and measure 16″. Continue measuring in 16″ increments until your desired placement. Knock against the wall to double check the placement of the support beam. 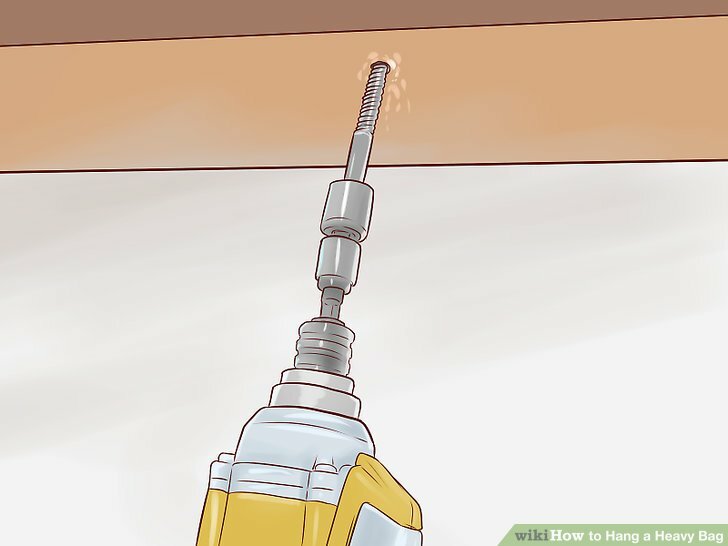 Drill a hole into the support beam. Place an eyebolt into this hole. Twist the eyebolt into the hole with your hand at first, and then tighten it with a wrench. Attach the chains to the corners of the bag. They should be included with your heavy bag. An s-hook should also be included, which you should connect to the chains. Finally, attach the bag to the eyebolt. Evaluate the security of the bag. Hit the bag a few times to make sure it is securely held in place. Rehang the bag if the attachments appear weak or fragile. These range from inexpensive to very pricey. Most mounts come with all the nuts and bolts needed to install them. You can find mounts at sporting goods stores or online. Find the 3 or 4 ceiling joists or support beams. You can find ceiling joists or support beams by using a stud finder. 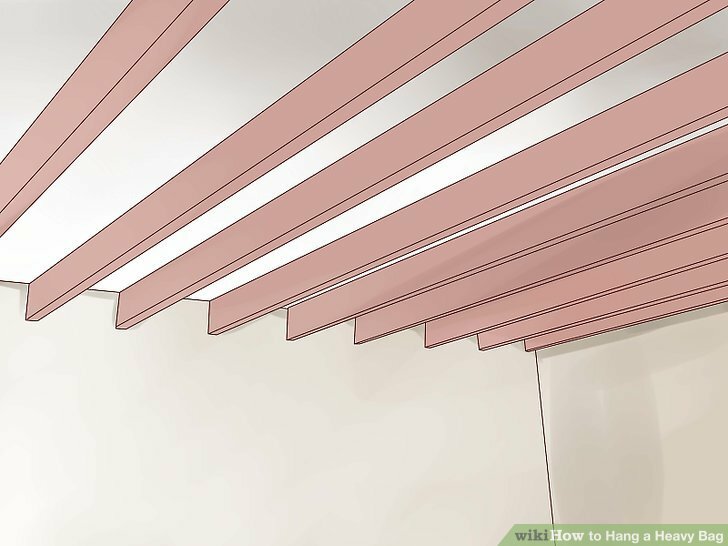 Make sure that you find ceiling joists in an area that allows movement. Your bag will be mounted on a middle joist. Joists are usually placed 16″ apart. If you don’t have a stud finder, you can use a measuring tape to measure from the edge of the wall, marking every 16″. In some houses, the joists may run up to 24″ apart. Use the knock test to double check. If you knock on the ceiling and hear a hollow sound, there is no joist. If the sound is not hollow, you are knocking against a ceiling joist. Drill holes into the ceiling joists. 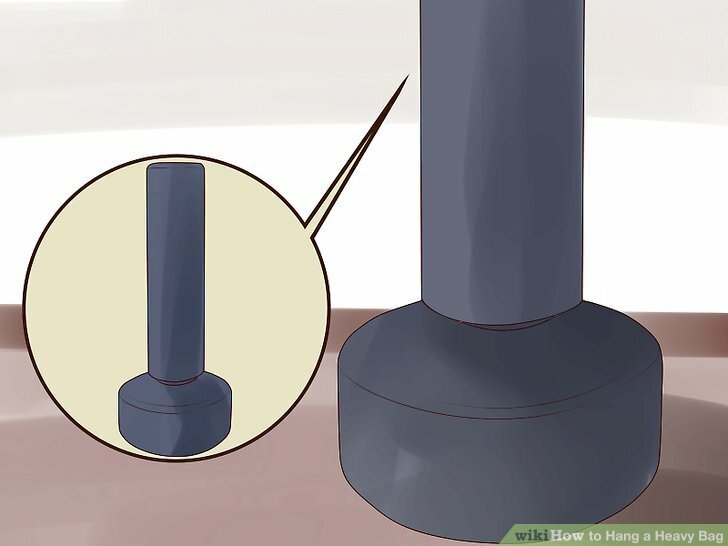 Use a level to make sure that the holes you are drilling are straight across the joists. 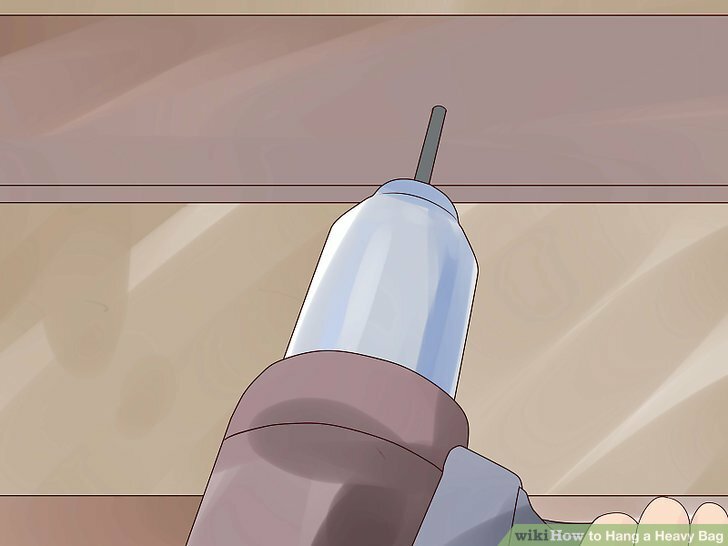 When you drill the holes, make sure to drill them into the center of the joist. Attach a 2×6 hardwood board to the ceiling. This is going to be the base for the mount. The 2×6 should be long enough to span all the ceiling joists and support the screws. Attach the board to the ceiling using the newly drilled holes and wood screws. 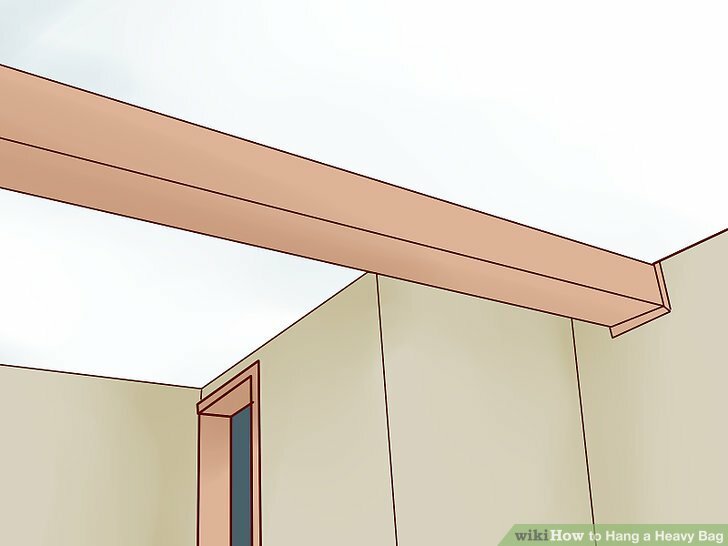 You want to connect the board to the ceiling at each joist. You can use a 2×4, but a 2×6 or higher will provide more support for your heavy bag. Attach the mount to the hardwood board. Most mounts include all hardware needed to attach the mount to the ceiling. 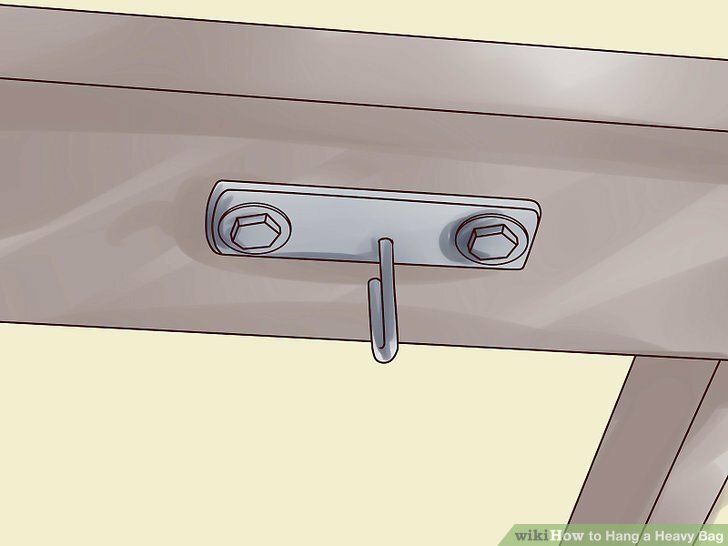 You may need a screwdriver, drill, or other tool to attach the mount. 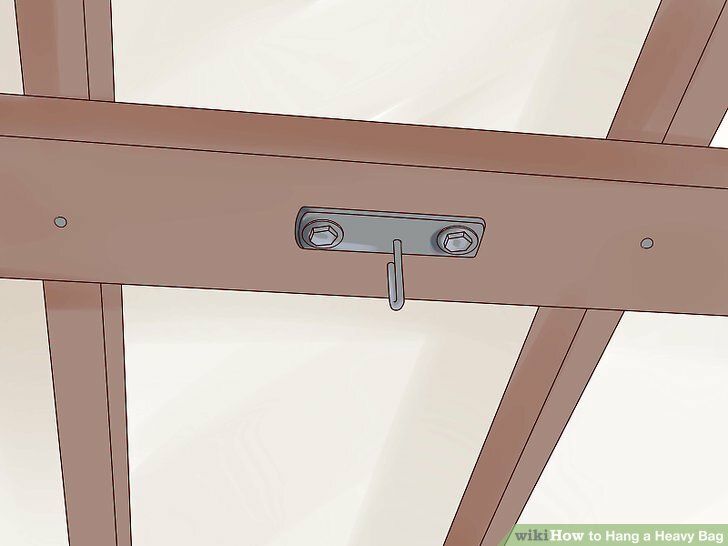 You should attach the legs of the mount in the center of the middle ceiling joist. 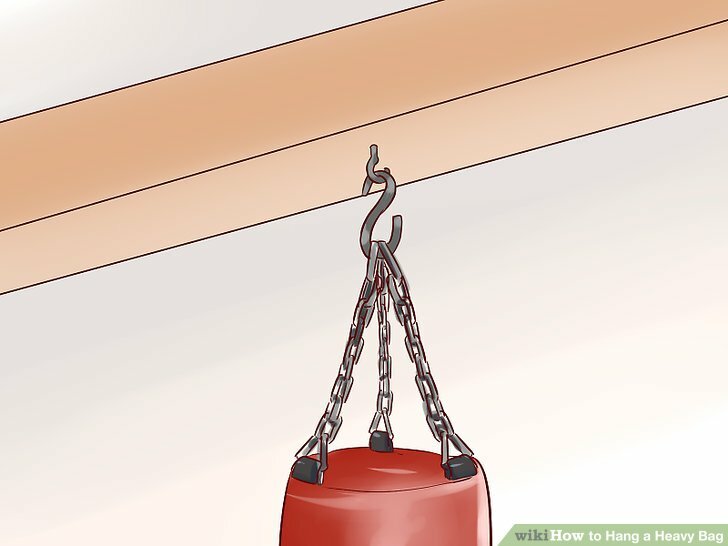 If hanging a heavy bag from the ceiling worries you, try attaching it to the wall. Most athletic stores sell wall mounts that include all hardware needed to attach it to the wall. This method is only recommended for masonry walls. Otherwise, you might cause damage to your house. 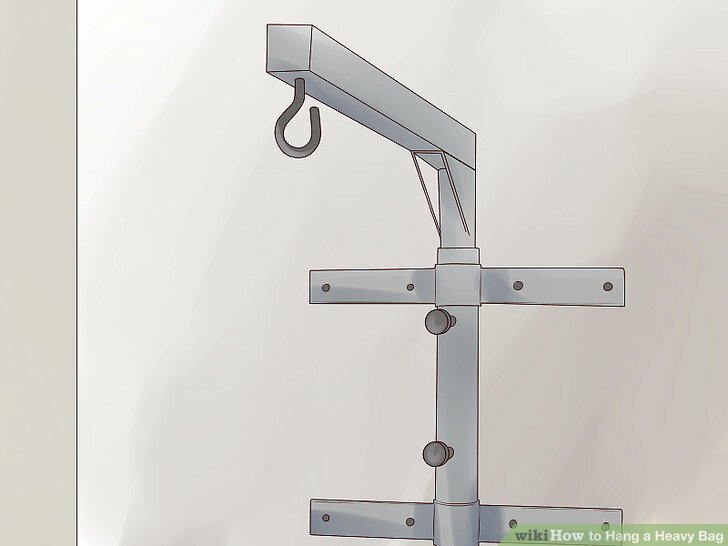 If hanging a heavy bag from the ceiling or wall is impossible, there are many free stands available. Some even have wheels for added mobility. Free stands must be weighed down to prevent movement during use. Heavier bags usually require around 300 pounds of weight to prevent movement, although lighter bags may be held down with as little as 100 pounds. If you’re using a free-standing rack, simply attach the chain on the heavy bag to the S-hook on the rack. No installation is required.